In Carvalho, Portugal, Iron Man and Black Widow search underwater for a UFO that was reported in the area. They later discover the ship is a massive vessel which attacks them with missles! Following their capture, the two Avengers discover the attack was orchestrated by the White Spider. She reveals that she was the Russian replacement for the Black Widow after she defected. Meanwhile at Avengers Mansion in New York City, the remaining Avengers are attempting to lift Thor's hammer off the ground as part of a team building exercise. 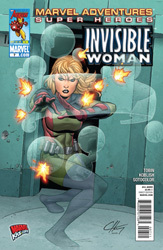 Captain America, Invisible Woman and the Vision have had no luck and it is now Nova's turn. Richard Rider gives it his best effort but also fails. During his attempt, Nova's hands slip off the hammer and he goes flying into the back wall! Later, Natasha escapes her handcuffs and runs to free Iron Man. Before she does, the Black Widow stops to disable the ship's cloaking device. Before the White Spider can reactive it, the Sub-Mariner and his army arrive to investigate the now visible ship! As Namor begins to destroy the invading ship, Natasha frees Iron Man and they escape to the surface. Along the way, the Sub-Mariner is momentarily confused to see the Black Widow. Suddenly, he realizes that she is the Natasha from the future! When the King of Atlantis returns to his kingdom, he apologizes to his shackled guest for his delay. The guest is... another Black Widow!